THE FIRST time I encountered protesters dressed as nuns was when I lived in the Bay Area of San Francisco in 1984-5. Sister Mary Boom Boom and her fellow Sisters of Perpetual Indulgence were fixtures on the flourishing protest scene. 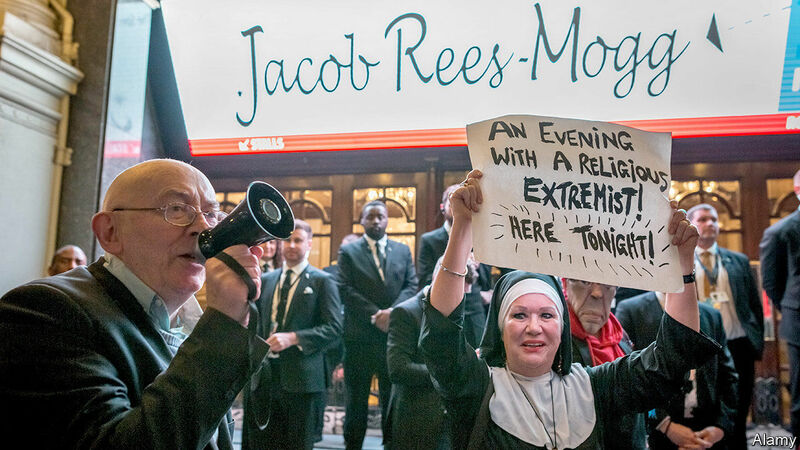 This week I encountered another one protesting against Jacob Rees-Mogg’s appearance before a sell-out crowd of 2,300 at the London Palladium. This particular “nun” was a woman, rather than a man like the American sisters. But her worries were the same—that the right-wing was bent on depriving gays and women of their civil rights and restoring an oppressive patriarchal society. I know that because she told me in no uncertain terms. The nun-protesters’ diatribe set off two (contradictory) lines of thought in my mind. The first was that, despite his love of all things English, including double-breasted Saville Row suits, Mr Rees-Mogg is a rather American figure. He combines an unapologetic belief in free-market capitalism with an equally unapologetic belief in traditional morals. While most British Thatcherites such as Liz Truss, the chief secretary of the treasury, emphasise that they are both economic and social liberals, Mr Rees-Mogg sounds like a member of the American moral majority when he talks about marriage and abortion. He is also importing into British politics the very techniques that made Newt Gingrich such a disastrous success in the United States in the 1990s: willingness to lead a party-within-party; a knowledge of what excites the media (turning yourself into a “character” is now, alas, part of the political game); and, above all, a talent for trashing the informal rules of the game in pursuit of your ideological vision. The two men even share a taste for eccentric versions of history. The second thought was that Mr Rees-Mogg’s enthusiasm for traditional morality is much more of a problem for a British politician than an American one. The audience cheered when he defended his record as a financial entrepreneur. He started his company, Somerset Capital, in the basement of his house and it now has $7bn under management. The fact that it bases some of its operations in the Cayman Islands did not worry the Brexit-supporting audience one jot. They were much more muted when Fraser Nelson, the event’s host, quizzed him on abortion rights. On this most sensitive of subjects the American public may be divided, but Britons are overwhelmingly on the side of the protesting “nun”. THE ATMOSPHERE in British politics is so frenzied these days that politicians risk creating fake news stories against their will. Hilary Benn gave a briefing on the state of Brexit to a group of us on the morning of February 25th, around the corner from the House of Commons. As he left the building he was confronted by flashing cameras and jabbering journalists. It turned out that the newly formed Independent Group of MPs—the Tiggers—was holding an inaugural meeting in the building and the journalists were on the look out for fresh defections. Mr Benn is a member of the Labour aristocracy: the son of Tony Benn and, significantly, one of the leaders of the moderate faction of Labour MPs that is doing battle with his father’s ideological heir, Jeremy Corbyn. A Benn defection would have been a big moment in Labour history. But despite the prayers of the assembled journalists it didn’t happen. I WAS lucky enough to get to know John Whitehead a little when I lived in America. Whitehead was the embodiment of the old-WASP American establishment that ran the country with such success for so many decades. He was in charge of Goldman Sachs when it was still a partnership and served as deputy secretary of state under Ronald Reagan. Andre Previn’s death this week reminds me of a nice story Whitehead once told against himself. Flying back from New York to London on the Concorde he found himself sitting next to a man who he took to be Previn. He told “Previn” what an honour it was to be sitting next to him and how much he enjoyed his various versions of Beethoven, Brahms, Holst and so on. Only as they descended on New York did Previn inform him that he was, in fact, Paul McCartney. ONE OF the many hidden costs of Brexit is that incompetent ministers are kept in their jobs when, in normal circumstances, they would have been sacked with a spanking. Chris Grayling is so incompetent that he is universally known as “failing” Grayling. This week the man who is in charge of the nation’s transport system succeeded in walking through the wrong lobby as if turning left or right is merely an irrelevant detail. But he can’t be sacked because he is a leading Brexiteer—one of the first cabinet ministers to tell David Cameron that he was going to campaign for Brexit—and so is effectively protected by the 100-strong phalanx of pro-Brexit MPs (a phalanx that, incidentally, includes another serial bungler, Iain Duncan-Smith). The Tory Party will surely pay a heavy cost for protecting incompetents like Mr Grayling. The Labour Party can afford a certain amount of incompetence because people judge it more on its intentions than its performance. The Conservative Party is all about performance rather than idealism. At the next election (which could come much sooner than most people think) the Labour Party should issue its supporters with giant cardboard cut-outs of Mr Grayling and instruct them to parade around every station in the country. That could just shift enough votes to put Jeremy Corbyn in Downing Street. THERE IS no shortage of things to be depressed about at the moment given the agonies of Brexit, the threat of war between India and Pakistan and the Trump scandals. But I must confess to being particularly depressed by a recent op-ed about the state of the academic study of history by Max Boot in the Washington Post. Mr Boot points out that the number of graduate degrees granted in history declined from 34,642 in 2008 to 24,266 in 2017. Today only 2% of male undergraduates and 1% of females major in history compared with more than 6% and nearly 5% respectively in the late 1960s. He puts the blame on two things: first, the retreat from the public sphere into esoteric academic debates and second, the growing obsession with “cultural, social and gender history” and the near obsession with the history of marginalised and oppressed groups. I note that a similar thing is happening in Britain. From 2007-8 to 2016-17 there was a drop of 11.6% of students taking “historical and philosophical studies” in British universities and a 21.3% drop of students taking language degrees, which have a strong historical component. Mr Boot attracted some vociferous responses to his strictures about “cultural, social and gender history” but I’m sure his explanation applies just as well to Britain as it does to America. The focus on marginalised groups and “cultural” studies was a valuable corrective to traditional history which focused almost entirely on the deeds of white men, particularly white male politicians. But in many history departments the “marginal” has become central and a corrective has become an orthodoxy: today you can go through a history degree learning plenty about popular superstitions and nothing about the development of constitutional government. This is not only disorienting for many students. It is also boring them to tears. Ageing professors like to think that they are breaking new ground with their lectures on witchcraft and the rest. But in fact they are just inflicting the excitements of their youths, many decades ago, on an audience that is more interested in understanding why on earth liberal democracy is in such trouble than why peasants once believed odd things. Keith Thomas’ path-breaking “Religion and The Decline of Magic” was published in 1971, before today’s students were born. There is a lot of talk these days about “decolonising the curriculum”. I think one way to revive historical studies is to engage a different sort of decolonisation—free the history curriculum from the Foucault-and-Fanon obsessed puff brains who seized control of it in the previous generation and start focusing again on the great questions that were once at the heart of the syllabus: how can power be tamed by constitutional arrangements? What are the great narrative threads that define British history? What role have extraordinary individuals played in shaping events? All that is supposedly new in historiographical fashion has become old and all that is old has become exciting again. Previous PostPrevious What would a no-deal Brexit mean for air travel?